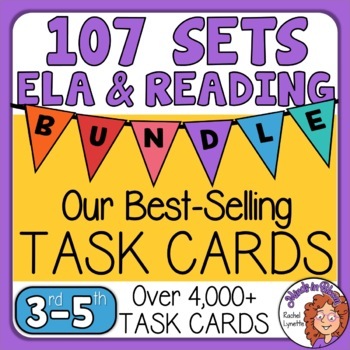 This huge bundle of task cards includes reading skills and strategies, figurative language, vocabulary, sentence building and punctuation, parts of speech, affixes and roots, writing prompts, and plenty of overall ELA test prep and review. There are 107 products in this bundle, but you will get closer to 112 sets of task cards as a few include multiple sets within a single product. Also, some sets include more than 32 cards. There are more than 4,000 task cards are included in this bundle! Most of the sets also include one or more challenge cards that can be used to extend and/or differentiate the activity. There are also student response sheets and answer keys. A few sets feature handouts or posters as well. Many of these sets have been revised and now include black line versions of the cards for printing on colored paper. Also includes Digital Boom Learning Access Links for 8 of the task card sets! Boom is an easy and fun way to use task cards digitally! This bundle is for single classroom use only. This means you may not share these task cards with other teachers. They are only for you to use with your students. These task cards may not be put on the internet, sold, or distributed in any form. These task cards were created by Rachel Lynette and are protected by copyright. They may not be copied, partially copied, altered, or claimed as someone else’s work.